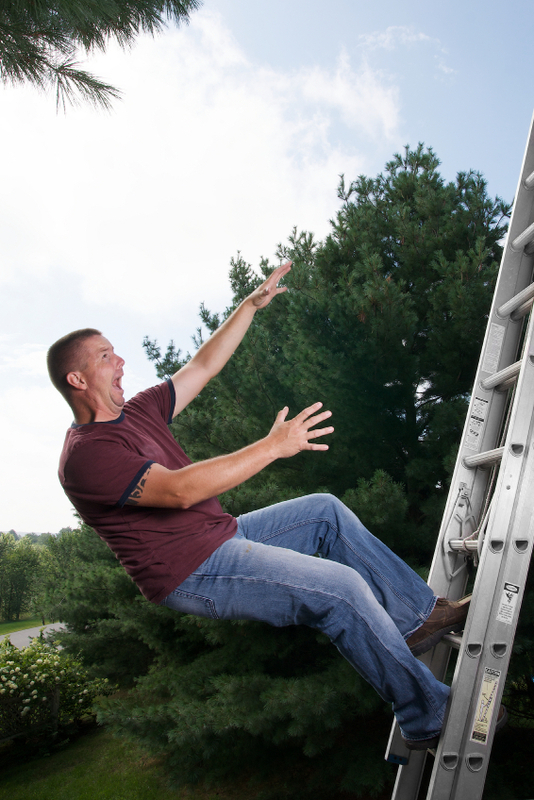 Millions of people every year are injured from falls at home that could have been prevented. Nearly six thousand are killed. That makes falls at home the leading cause of home injury and injury-related death in the U.S. That’s pretty scary. What’s even scarier is that only a quarter of homeowners take any action at all to make their home free of trip and fall hazards. All stairs and steps should be protected with a secure banister or hand-rail on each side that extends the full length of the stairs. If you use throw rugs in the bathroom or anywhere your home, place them over a rug-liner or choose rugs with non-skid backs to reduce your chance of slipping on this very common trip and fall hazard. Always use sturdy step stools with hand rails when climbing is necessary. When climbing on a ladder is necessary, always stand at or below the highest safe standing level. For a stepladder, the safe standing level is the second rung from the top, and for an extension ladder, it’s the fourth rung from the top. Be aware that conventional window screens are not designed to prevent a child’s fall from a window. Install specially designed window guards on upper windows with a quick-release mechanism so that they can be easily opened by an adult in a fire emergency. Never leave young children unattended near open windows and move furniture away from windows in children’s rooms to prevent them from reaching windows. Wipe up spills when they happen. Cover areas under and around play equipment with soft materials such as hardwood chips, mulch, pea gravel and sand. Materials should be nine to 12 inches deep and extend six feet from all sides of play equipment. Check equipment for signs of deterioration or corrosion including rust, chipped paint, splitting or cracked plastic components or loose splinters. Avoid putting play equipment close together. For example, stationary climbing equipment should have an uncluttered fall zone of at least six feet in all directions of equipment. Slides and platforms for climbing equipment should not exceed heights of six feet for school-age children or four feet for pre-school children. Avoid elevated platforms, walkways or ramps that lack adequate guardrails or other barriers. Watch for possible tripping hazards such as rocks and roots. Clear this debris from your child’s play area. Always supervise children when they are using playground equipment to help prevent falls. For more advice and information to prevent trip and fall hazards, and falls at home, please visit mysafehome.org. Pingback: What Is Premises Liability And How Could It Impact You?